You are here: Home / Shop Talk / What’s An Old Ford Truck Worth? I received a message at work this past week from an Arizona F-100 truck enthusiast who is going through some lifestyle changes and had decided to put his pickup up for sale. It can happen. One of the toughest parts of selling an old friend is determining a price. After all, the bottom line is to figure out what will the market bear? If you put the price at $500 it will go to the first guy who sees it. On the other hand, ask $200K and the buyers will be limited if not nonexistent. I again thought of this F-100 seller and how he possibly determined his $82,500 asking price. After all, we are talking about a truck that had an MSRP of $1577 back in 1956, some 58 years ago. Referencing the Kelley Blue Book and the NADA guide, they are both in concert with today’s value of a ’56 F-100 as being about $9000+ for Low Retail, $18,000 plus for Average Retail and right at $60,000 for High Retail. That’s good news for some of us and disappointing to others who have invested significantly more in the restoration and customization of their Fat Fendered Ford truck. All of us with a computer have undoubtedly searched E-bay just to see what F-100’s across the country are selling for, or to be assured that it is a good investment to spend money on the purchase of a new chassis, front suspension kit , paint job, crate engine, interior or even the addition of a luxury such as air conditioning. It all costs money and we wonder if we will ever see those dollars again if there comes a time when we have to cash out. The key to determining the value of your truck is to be honest. Many trucks on today’s market are projects or parts trucks with a lot of potential in our eyes. Those trucks go for whatever a buyer is willing to pay but even an F-100 cab often times will sell for good money. If it is a driver that is still in need of cosmetic and mechanical work, our old trucks can still fetch the “low retail.” But what about an F-100 with a slick paint job and sound mechanical drive train? What is it worth? The best part of reviewing your investment is the fact that old Ford trucks are at the top of the chart when it comes to overall value among the classic trucks. 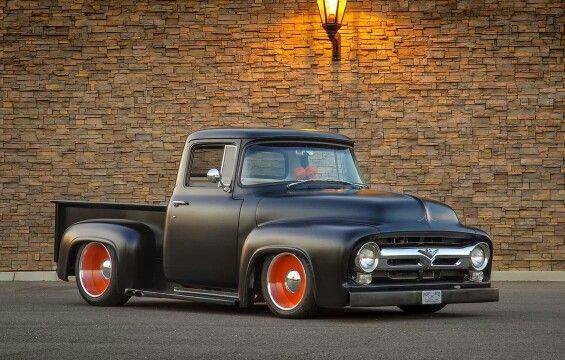 You won’t see a ’56 Dodge truck bringing the same sale price as an F-100. That’s good for us as supply and demand is on our side. Simply put, there are more potential buyers than sellers and that does keep the value of your truck rather high. For a growing number of truck club members, I have to tell you there is no guide to use to put a number on your truck’s value. You can and should have it appraised by a professional who can add up the price of the individual parts that constitute the value of your ride. This step will come in very handy for ensuring you have your truck fully insured for its replacement value, and a good target price if the day comes when you opt to sell it. Seeing photos of this Arizona truck, I am sure it will bring the asking price. It’s that sharp. After seeing one of my chassis customers fetch $220,000 for an F-100 at a most recent auction, the sky is the limit! Obviously, not too many of us have reservations when it comes to spending money on our trucks. Later, Steve.